MP3 or WAV audio files with SMPTE timecode embedded into the right or left channel of the audio track. MP3 with timecode embedded into the id3 metadata of the file. QuickTime MOV files with timecode metadata embedded. Time Stamps start at 00:00:00. It’s like a timer on your watch. 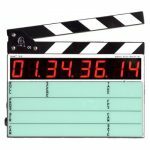 Send us a list of the starting timecode for your media files. Timecode is time as it relates to your video footage. For example a lot of videotapes or memory cards begin at 01:00:00:00. Then tape number two would start at 02:00:00;00, tape three at 03:00:00;00 etc. The default timecode in non-linear editing software such as Final Cut Pro or Adobe Premiere is 01:00:00;00. If you were to fast forward 10 minutes and 30 seconds on tape one then your timecode would read 01:10:30;00. Most transcription software programs cut-off the last two digits, frames of a second, so the transcript would display 01:10:30 (HH:MM:SS). Why is Timecode Useful for Transcription? When timecode is on a transcript you can use it to reference where things are being said. So if you have a 50 page document you can easily locate on your tape where the good soundbites are. If the timecode reference was not there you would spend a lot of time fast forwarding and rewinding trying to pinpoint where things were said. Without timecode your editor could spend hours looking for soundbites, however with timecode it would take the editor moments to find the audio he or she is looking for. The most popular method is timecode burned into a video file. The transcriber, as they watch the video, will have a visual reference of the current timecode. BITC is a great method because your metadata won’t display on your master footage and that metadata will be lost when you compress your footage for transcription. Prior to conversion, you can burn-in the timecode into any type of video file including MOV, MP4, WMV, and many more file formats. Timecode in the meta data of your audio files is another way of implementing timecode transcription. Broadcast wave files (BWF) allow you to enter in the timecode information and they are easily viewed using a software like Wave Agent. You can also add timecode in id3 of a Soundevices MP3 file. Only certain MP3 audio recorders can insert timecode metadata into an MP3 file. One form of timecode is time stamping, which is an elapsed time. You would start your transcript at zero or 00:00:00 and time stamp the document approximately every 30 seconds. This method will not match your master tapes, however it is very useful for meetings & conferences to keep track of when people were speaking and what they were saying at that time. Another method is SMPTE timecode. This is analog timecode signal that is typically placed on the right channel of a stereo output wave file. SMPTE is a little complex and dry but if you’re interested in finding out more this is a handy resource. One drawback of SMPTE is most transcription software cannot read SMPTE and you need to buy audio splitters and converter boxes to get the SMPTE signal onto a Word document in numeric form.